That sentence has often run through my mind during my repeated listens to Montreal producer CFCF’s Night Bus II mix, released a month ago through the stellar music blog Gorilla Vs. Bear. Go to GVB now and download Night Bus II while it’s still available. It’s fantastic, and it’s free. CFCF (real name Michael Silver) is certainly prolific, having released a half dozen mixtapes, a couple dozen remixes (of everyone from Aaliyah to Young Galaxy), three EPs, and a full-length album just in the last 2-3 years. I’d recommend everything I’ve heard, especially Continents, the full album. Its 11 instrumental tracks feature a good mixture of innovation and accessibility, with a lot of analog instrumentation and hummable melodies to accompany and augment the electronic textures. Night Bus II is remarkable for its diversity, as revealed in the wide-ranging artist list above. And yet, the mix is also characterized by a relentless unity, accomplished through CFCF’s masterful tweaking, his beatmaking, and his ear for bringing out the common threads of emotion and mood in wildly divergent source material. That mood-based unifying element, which CFCF first argued for in last year’s Do U Like Night Bus? mix, gives the emerging “night bus” genre tag its emotional center. The mood, and CFCF’s skill in evoking and sustaining that mood, allow synth-pop, rap, downtempo, IDM, R&B, and even sci-fi soundtrack sounds to rest comfortably side by side and bleed into one another imperceptibly. The list above may feature ten “tracks,” but this is most certainly a seamless whole, one that is pretty much uniformly sensual, rapturous, and yet slightly sad and latently menacing from start to finish. That may sound like an odd combination of adjectives, but it’s the best I’ve got to describe what night bus sounds like. 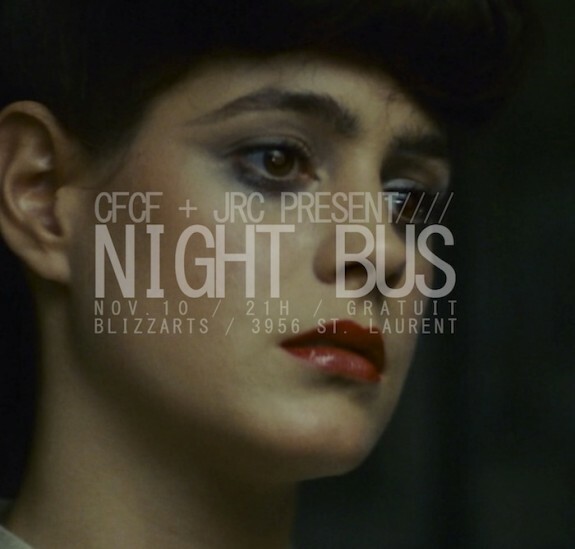 But what does night bus, both the genre and this outstanding mix, feel like? For me, after more than a dozen listens to Night Bus II, it feels like the glorious moment when you understand that solitude does not equal loneliness, that solitude can in fact be a cause for celebration. Night Bus II is a compelling thesis statement on the theme that sometimes you can gain deep emotional insight, and connectedness to something greater, with no prompts or companions but a pair of headphones, a night ride, a blurred streetscape seen through the bus window, and your own thoughts and memories.